Before we left, I brought DC up and glued a set of boots on her. She has been without shoes all around since some time in January. I'd taken her hinds off with the intention of resetting them, only to find I was out of the nails for her shoes. Oops. And by the time this ride came around, I hadn't acquired more. But, at Death Valley, Dave Rabe had given me a full set of size 00 EasyBoot glue-ons. I already had a pair of 0s for her fronts. So I went ahead and did a full set of glue ons for this ride. We had an uneventful drive to camp and found a decent place to park where I could put Hoss out on his stake. It was even still daylight when we arrived. It seems no matter how early I leave for a ride, I cannot seem to get there until the last minute. I even miss ride meetings for driving late. So it's extra nice when I can manage to arrive at a reasonable hour. With DC having had trouble in the past with rides, I decided I'd ride Hoss the first day so she could settle in. She does fine by herself in camp, other than not eating anything other than hay, and I hoped by leaving her she would have time to recover and rehydrate from the drive. 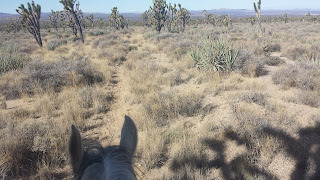 In the morning I got Hoss saddled up and we got out on trail. It was a nice day, not cold and not hot. While it was chilly, I was able to leave my jacket at camp rather than have to deal with it during the day.